Q: Singapore's Minister for National Development and Second Minister for Finance Lawrence Wong told the Singapore Regional Business Forum on August 15 that China's Belt and Road Initiative will change Asia's development in the next stage, serve as the largest potential platform for regional cooperation, strengthen regional connectivity and speed up the development of Asia's infrastructure. Undoubtedly, China has played a key role in the integration process. How do you comment on that? A: We have noted the relevant remarks of the Singaporean side. China stands ready to step up the cooperation on the Belt and Road with Singapore, promote greater development of the China-Singapore all-round cooperative partnership progressing with the times and bring more benefits to the two peoples. The Belt and Road Initiative is an important international public good, a crucial platform for cooperation between China and relevant countries, and an open and inclusive development platform. It is conducive to injecting new impetus to the regional and global economic growth and beneficial to economic growth of countries around the globe. In May, China successfully held the Belt and Road Forum for International Cooperation, which has further specified the direction of the Belt and Road cooperation in the future, planned a specific roadmap for the building of the Belt and Road, and identified a group of key Belt and Road programs to implement. The cooperation on the Belt and Road has been enhanced both in breadth and depth. So to speak, the Belt and Road Initiative conforms to the trend of the times, complies with the law of development, and serves the interests of people of various countries, thus having broad prospects. China stands ready to work with Singapore and other countries to follow the cooperation principle of extensive consultation, joint contribution and shared benefits, jointly build the Belt and Road, accelerate the process of regional economic integration and play a positive role in promoting common development and prosperity of the region. Q: According to reports, yesterday in the Ladakh section of the China-India border, there was fighting with stones between the Chinese and Indian troops. Can you give us an account of what happened from the Chinese perspective? Has China talked to India on the current situation and how to lower tensions there? A: I am not aware of the details you mentioned. The Chinese border troops have always been committed to upholding the peace and tranquility in the China-India border areas and patrolling in the Chinese side of the Line of Actual Control. The Chinese side urges the Indian side to abide by the relevant agreements and treaties between the two sides, faithfully follow the 1959 LAC and safeguard peace and stability in the border areas of the two countries. Q: According to the data released by the US Treasury yesterday, as of the end of June, China has overtaken Japan as the largest owner of US treasury bonds. How do you respond to that as China becomes the largest creditor of the US? A: You should refer this question to the financial authorities. What you said is another reflection that China and the US have formed a pattern of deeply converging interests and mutual dependence. We hope that the two sides can work together to uphold the mutually beneficial and win-win situation of China-US economic and trade relations. Q: It is reported that yesterday the Philippine Defense Minister said that China will not occupy any new features in the South China Sea. Can you confirm that? A: China's stance on the South China Sea issue has been consistent. It has indisputable sovereignty over Nansha Qundao and its adjacent waters. 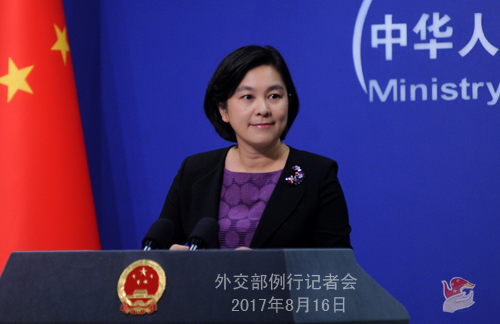 China will continuously stay committed to peacefully resolving the relevant disputes through negotiation and consultation with the sovereign countries directly concerned and keep on comprehensively and effectively implementing the Declaration on the Conduct of Parties in the South China Sea (DOC) with ASEAN countries. 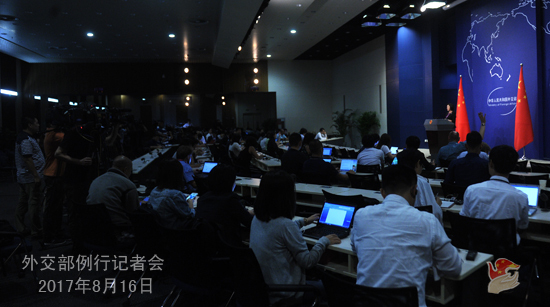 Q: The US Chairman of Joint Chiefs of Staff General Joseph Dunford is in China on a visit. Will he have or has he had any meetings with Chinese leaders? If so, could you provide some details? Can you comment on the significance of this visit for US-China relations? A: China's Ministry of National Defense has issued a press release on the talk held between Fang Fenghui, member of China's Central Military Commission (CMC) and Chief of the CMC Joint Staff Department, and the US Chairman of Joint Chiefs of Staff General Joseph Dunford. Chief of the CMC Joint Staff Department Fang Fenghui said that President Xi Jinping and President Donald Trump highly value the development of the relations between the Chinese and the US militaries. They have jointly drawn the blueprint for the relations between the two militaries and pointed out the direction for their cooperation. Cooperation is the only correct choice for China and the US and the two militaries can surely become good cooperative partners. The two militaries should well implement the important consensus between the two heads of state, maintain the momentum of steady development of the relations between the Chinese and US militaries, uphold and expand their cooperation in the field of common interests, and properly handle the negative factors that affect the their relations. The Chinese troops are wiling to work with the US side to strengthen strategic communication, enhance strategic mutual trust, deepen practical cooperation, properly handle conflicts and differences, effectively manage risks, advance the sustained and steady development of the two militaries which will serve as an important stabilizer of the China-US relations. Joseph Dunford said that the US is willing to work with China, follow the framework planned by and the consensus reached between the two heads of state, jointly seek and expand the areas for cooperation and stay committed to promoting the relations between the two militaries for greater development. He believed that the two militaries should build and give play to the communication and coordination mechanism, enhance mutual trust and reduce miscalculation and frictions. The two sides should create every opportunity to deepen exchange and cooperation, constructively resolve the existing problems and move towards mutual trust, interaction and cooperation. Follow-up: Did the two sides discuss the Korean Peninsula nuclear issue? Did Joseph Dunford meet with other leaders? A: Also, Chief of the CMC Joint Staff Department Fang Fenghui and Joseph Dunford exchanged views on the issues of mutual concern, including the Taiwan issue, the South China Sea issue, and the Korean Peninsula nuclear issue. They also jointly signed the Framework Document of the Dialogue Mechanism of the Joint Staff Departments Between the Chinese and the US Militaries. As to the other meetings during Joseph Dunford's visit, I will refer you to the Ministry of National Defense. Q: According to media reports, recently several lawless persons disguise themselves as Chinese diplomatic missions overseas to carry out telecom swindle against Chinese nationals. How do you respond to that? A: Recently, Chinese diplomatic missions in several countries have reported that some lawbreakers, in the disguise of Chinese diplomatic missions, made phone calls to local Chinese nationals and falsely claimed that their passports or travel documents had expired, their credit cards were fraudulently used or they were involved in international criminal case, asking the victims to dial a specified phone number or provide personal bank account information to pay fees correspondingly. China's Ministry of Foreign Affairs pays great attention to this and has issued alert along with its diplomatic missions overseas several times. Chinese nationals are advised not to readily believe the phone calls or emails that ask for personal credit card information, money transfer or remittance. In case of such phone calls and emails, the Chinese nationals must remain highly alert. If you have any question, you may seek verification through the contact information on the official website of local Chinese diplomatic missions. Q: According to media reports, the US Department of State issued the 2016 Report on International Religious Freedom, criticizing China's performance in terms of freedom of religious belief. What is your comment on that? A: We have noted the report you mentioned. The Chinese government fully respects and protects citizens' freedom of religious in accordance with the law, and the Chinese people of all ethnic groups and in all regions are entitled to freedom of religious belief. The so-called US report confounds black and white in disregard of facts and make unprovoked criticism on China's situation of religious freedom. The Chinese side firmly opposes this and has lodged serious representations with the US side. Facts have proved that the US is far from perfect. We urge the US side to respect the facts, mind its own business and stop the wrongdoing of interfering in other countries' internal affairs with the so-called religious issue as an excuse. Q: It is reported that Indian Prime Minister Narendra Modi and the US President Donald Trump, during their telephone talk on India's Independence Day, have agreed to enhance peace and stability in the Indo-Pacific region by establishing a new two-by-two ministerial dialogue. Do you have any comment on this? A: I have noted the relevant report. We hope that the development of normal relations between India and the US will be conducive to regional stability and development. Q: Do you have any updated comments on the situation on the Korean Peninsula in regards to the recent comments made by the South Korean President Moon Jae-in that South Korea should have a say in whether the US should make any military action? A: I gave my answers to the relevant questions yesterday. We have always advocated properly resolving the Korean Peninsula nuclear issue through peaceful means and upholding peace and stability on the Korean Peninsula, which conforms to the common interests of various parties, and is also worth the concerted efforts of various parties. At present, the situation on the Korean Peninsula is highly complex and sensitive. We hope all relevant parties can exercise restraint, bear the interests of their people and regional peace and stability in mind, make right judgments and choices in a responsible way, do more things that are conducive to easing tensions and enhancing mutual trust and jointly bring the Korean Peninsula issue back to the right track of proper settlement through dialogue and negotiation at an early date. Q: Is the incident in Ladakh a fallout of what happened in Doklam? A: As to the trespass by the Indian troops in Dong Lang, China's stance is very clear and firm. The Indian side should immediately pull out all the personnel and equipment that have illegally crossed the boundary. This is the basis and prerequisite for the settlement of this incident. As to the friction in Ladakh reported by media, the Chinese border troops have been patrolling in the Chinese side of the Line of Actual Control. The Chinese side urges the Indian side to abide by the relevant agreements and treaties between China and India and faithfully safeguard peace and stability in the border areas of the two countries. After the press conference, the following question was raised: According to media reports, the Philippine Foreign Secretary Alan Peter Cayetano said to lawmakers on August 15 that the Philippines was working on a commercial deal with China to explore and exploit oil and gas resources in disputed areas of the South China Sea. Can you confirm that? Hua Chunying said that, in fact, in the 1980s, China's proposal of "shelving differences and seeking joint development" was put forward to the Philippines in the first place. 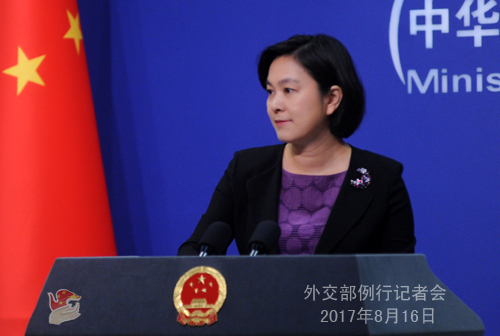 Over the decades, China has been implementing this proposal in handling the relevant disputes in the South China Sea and developing the bilateral relations with the littoral countries of the South China Sea. According to international law and practices, before the maritime disputes are finally resolved, parties concerned should exercise restraint and spare no effort to make feasible provisional arrangements, which include establishing and improving the rules and mechanism to manage the disputes, conducting cooperation in various fields and promoting "shelving differences and seeking joint development" so as to uphold peace and stability in the South China Sea region and create the conditions for the final settlement of disputes. The relevant cooperation and joint development shall not impair each other's own position and the final delimitation of boundary. China believes that as long as we follow the spirit of mutual trust and win-win results, China and the Philippines surely have the wisdom and ability to find a way of joint development that is acceptable to both sides, which will bring benefit to the two peoples and make the South China Sea a sea of peace, friendship and cooperation.